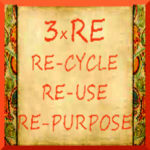 According to Wikipedia Upcycling is creative reuse, i.e. the process of transforming by-products, waste materials, useless and/or unwanted products into new materials or products of better quality or for better environmental value. So, it became my new passion and challenge, as well as my contribution to better environment. As I wish to make my items from waste materials as much as possible, my main focus right now is how to make a papier/paper mache clay using egg-boxes, towel- and toilet-paper rolls. How it works and what can be done of it, I explain in most of my posts and pages.